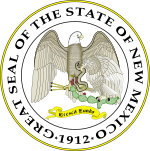 The Secretary of State of New Mexico is one of the elected constitutional officers of the U.S. state of New Mexico. From 1923 to 2015, every Secretary of State of New Mexico had been a woman. The current Secretary of State is Democrat Maggie Toulouse Oliver, winning the position in the November 2016 special election. The election was forced due to the resignation of former Secretary of State Dianna Duran in October 2015 after criminal charges were filed by the New Mexico Attorney General alleging the conversion of campaign funds to personal gambling debt. The Bureau of Elections administers elections and enforces local, state, and federal election laws. The bureau's duties include training county clerks and voting machine technicians, maintaining the state's voter registration database, filing petitions of candidacy for official running for election, and administering the Native American Election Information Program, which is a special program to help improve voter registration and voter turnout among the Native American populations within the state. The Ethics Administration regulates campaign finance and lobbying within the state, and provides ethics training to various parties involved in government. The Information Systems Division maintains the Secretary of State's computer systems, and assists the Bureau of Elections in the management of the voter registration system. The Operations Division provides various administrative and business-related services to the people of New Mexico. This includes filing of security interests under the Uniform Commercial Code and the Food Security Act of 1985, registration of trademarks, formation of general partnerships, limited partnerships, and limited liability partnerships (in New Mexico, corporations and Limited liability companies are registered by the New Mexico Public Regulation Commission). This division is also responsible for licensing of notaries public and issuance of apostilles. The Secretary maintains records of bills signed into law, referendum petitions, and legislative journals, and ensures that proposed amendments to the New Mexico Constitution are published in at least one newspaper in every county in the state for four consecutive weeks, in both English and Spanish. The Secretary also serves as registered agent for service of process for foreign corporations in some lawsuits. ^ Lee, Morgan (December 9, 2016). "New Mexico swears in newly elected secretary of state". SFGate. Retrieved December 9, 2016. ^ State of New Mexico (July 2012). Kathryn A. Flynn (ed.). 2012 Centennial Blue Book (PDF). Diana J. Duran. Office of the New Mexico Secretary of State. p. 224. This page was last edited on 13 February 2018, at 09:41 (UTC).